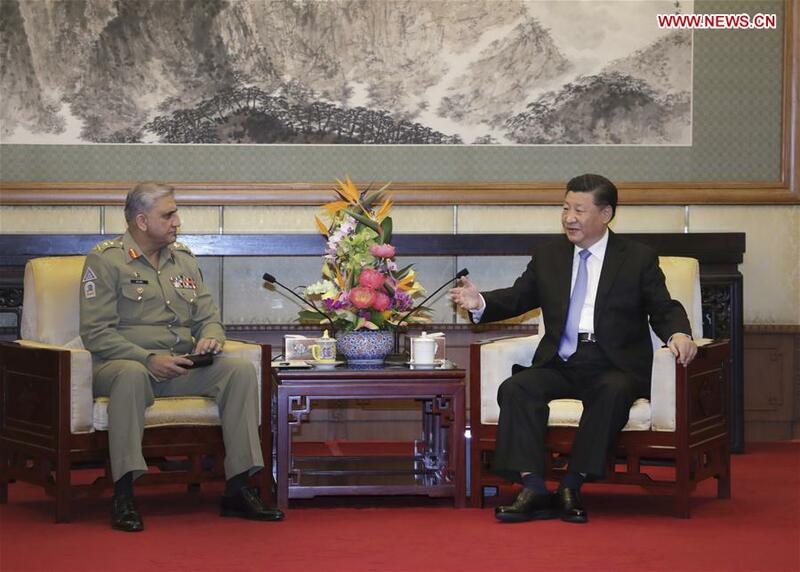 BEIJING, Sept. 19 (Xinhua) -- Chinese President Xi Jinping met with Pakistan's Chief of Army Staff Qamar Javed Bajwa here Wednesday, calling on the two countries to firmly support each other on issues concerning their respective core interests. Noting the China-Pakistan all-weather strategic cooperative partnership and that the two countries are "iron friends," Xi said the two sides have been keeping "highly aligned" with each other on major international and regional issues. China always places a high premium on China-Pakistan relations, Xi said, adding that the two sides had maintained a high level of mutual trust on issues of each other's major concerns. "As long as high-degree mutual trust and concrete measures are in place, the China-Pakistan Economic Corridor construction will succeed and deliver benefits to people of the two countries," Xi said. "At present, the international and regional situation is undergoing complex changes, and the two countries are supporting each other, helping each other and enhancing mutually beneficial cooperation, which have yielded fruitful outcomes," Xi said, adding that such efforts comply with the trend of the times. He also hailed the practical achievements reached during the deepening of cooperation between the two countries' militaries. The two countries' militaries should further deepen exchanges and cooperation in various fields and at all levels, take resolute measures against terrorist forces, make efforts to ensure the security of the China-Pakistan Economic Corridor construction and serve as a reliable safeguard for the common interests and common development of the two countries. Bajwa said the Pakistani side resolutely supports the Belt and Road Initiative, and Pakistan always places relations with China at a primary strategic position in developing foreign relations and always sides with China on issues involving each other's core interests. He expressed Pakistan's sincere thanks to the help China has provided to the country in various fields.